A serious problem for fruit tree growers may be keeping deer away from the fruit trees. While they may not actually be eating the fruit, the real issue is the nibbling away at tender shoots, resulting in a compromised harvest. Deer eating fruit trees is especially serious when the trees are very young and the perfect height for some lazy munching. The question is then, how to protect your fruit trees from deer? Deer feed on the tender shoots of dwarf and young trees whose lowly stature makes them easy pickings. They will also rub their antlers on a tree, damaging it irreparably. The most reliable method for deer proofing fruit trees is fencing. There are a number of fencing methods with some more successful than others in keeping deer away from fruit trees. When damage to trees is severe and there is a large deer population that isn’t likely to go away anytime soon, fencing is the most reliable deterrent. Conventional 8-foot woven wire fences are proven barriers to deer marauders. This type of fence is composed of two widths of 4-foot woven wire and 12-foot posts. Deer will crawl under the fence to get at tasty morsels, so it is important to secure the wire at the ground. This type of fencing is pricey and unsightly to some, but it is extremely effective, requires little maintenance and will last quite a long time. Alternatively, you can install an electric fence which encourages behavior modification amongst the deer. Although they can easily jump the fence, the deer eating your fruit trees may instead tend to crawl under the fence or just plain go through it. A “zap” from an electric fence will quickly change this habit and train the deer to stay 3-4 feet from the wires, hence the fruit tree. Think Pavlov. The cost for an electric fence is lower than an 8-foot surrounding fence. Some use five lines of high tensile steel wire, in-line wire strainers and high voltage which are very effective. However, they require more maintenance and frequent inspections than a conventional 8 footer and you need to maintain a 6-8 foot mowed swath along the perimeter to discourage deer jumping. You also encompass individual trees with a physical barrier of your own composition to deter the deer from eating the fruit trees. Beyond fencing, are there other deer proofing methods for fruit trees and are there any fruit trees deer won’t eat? If it isn’t illegal and there is a sizable population, a solution for some of you is hunting. If you live in an area where it is legal to open your land to hunting, consult a local wildlife conservation officer for pertinent information on the do’s and don’ts. 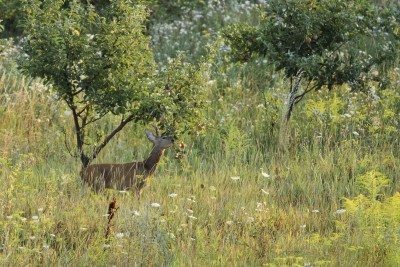 If you do not wish harm to come to the deer, there are other tactics that you can try to keep deer away so they don’t destroy your orchard. Soap hung form branches can temporarily deter feeding, as can many deer repellents. Apply repellents at the first sign of damage. These repellents can be composed of any number of noxious ingredients, as long as they either smell or taste so abhorrent that the deer decide to go elsewhere for breakfast. Some repellents contain putrefied meat scraps (tankage), ammonium, bone tar oil, blood meal and even human hair. Hang bags of these items 20 feet apart and 30 inches from the ground. Contact repellent, those that deter due to taste include rotten eggs, thiram and hot pepper sauce and should be applied on a dry day when the temp is above freezing. 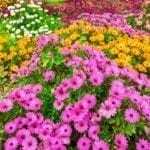 Some people decide to create their own repellents, combining some of these ingredients as well as others that strike their fancy with much dissension on whether there is any attributable success. The best results seem to be obtained when people consistently monitor and alternate repellent types. Commercial repellents can be purchased that contain denatonium saccharide, which makes things taste bitter. These should be applied during the dormant phase of the trees. All repellents have variable results. Lastly, you can try the use of guard dogs; my parents’ miniature schnauzer gets the job done. A free range dog works best, as the deer are smart enough to figure out that a chained hound has limitations. They will thumb their metaphorical noses and barge right in for a little nosh. 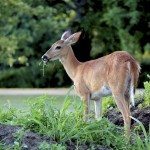 If you think it’s edible, chances are good the deer do too, so while there are trees, shrubs and plants that deer do not find palatable, there are no fruit trees deer won’t eat. The best deer proofing combines vigilance and a combination of deterrent methods, or build the eight foot fence.